TGIF Team Stryker fans! This page was fun to draw because it’s 99% action with large panels that I can really dig myself into. The challenge any artist will come across when drawing an ongoing book is making the same action look exciting in multiple ways. 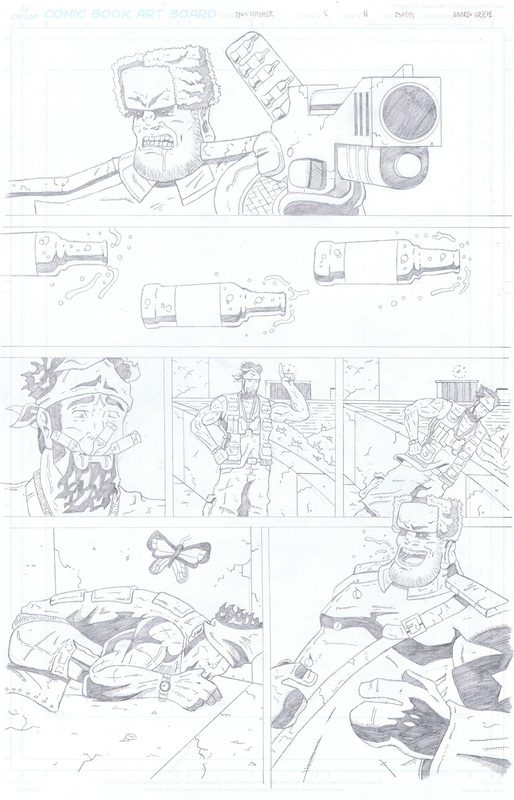 Drunkov fires his guns multiple times in this issue and each time I have to try to make it look exciting and dynamic. It’s the same challenge any Spider-Man artist faces when having to draw him swinging over and over again. The trick is usually trying to find new angles to display the action. I usually have characters firing their gun either at the camera or just off to the side of it which helps make the reader always apart of the action. Have a great weekend and don’t miss the newest page premiering on Monday!